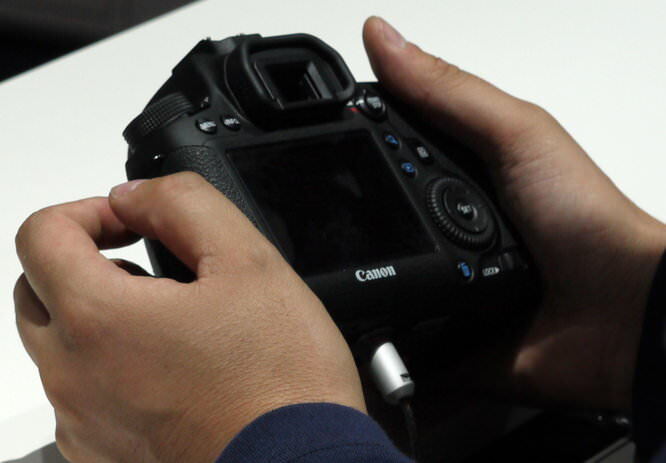 We go hands on with the new full frame Canon EOS 6D, the new 20 megapixel camera. Canon's new full frame Digital SLR, the Canon EOS 6D has impressed many with it's high specification and competitive price point. Previously users of the Canon EOS 5D Mark II had to choose whether to invest in the more expensive Canon EOS 5D Mark III priced at around £2700, whereas now they can purchase the Canon EOS 6D for around £1799, and also benefit from built in GPS and Wi-Fi. The camera is quite compact in the hand and it's quite difficult to demonstrate the size without actually seeing it. 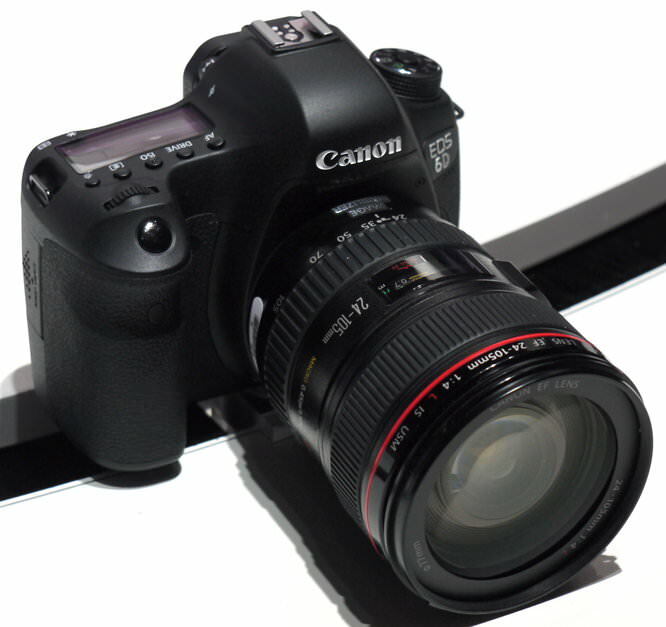 Unfortunately the Canon EOS 6D isn't likely to be available to buy until December. Could you do a comparison between the 5D Mk II/I and the 7D please? Hi Chris, I had a look at the 6D focusing in very low light, and it was able to focus, while the 5D Mark II would not focus and it was a case of having to use manual focus. (Same 50mm f/1.4 lens). So improvements have been made with focusing in comparison to the 5D Mark II, but it will be a while before the 6D is actually available for review. Thanks Joshwa, I was quite excited when I heard about the 6D as I had my sights set on the 5DmkIII but the price is way way too much. But the 6D's not that great even compared to my 7D (burst rate, AF points etc), the most attractive feature is the full frame. Think I still might go for the 5DmkIII if I can manage to save £3k. I was quite excited when I heard about the 6D as I had my sights set on the 5DmkIII but the price is way way too much. But the 6D's not that great even compared to my 7D (burst rate, AF points etc), the most attractive feature is the full frame. Think I still might go for the 5DmkIII if I can manage to save £3k. IMHO the 6D for what it has is not worth that money. Personally i would rather save a little more and buy the superb 5d mark iii. I must say though does any one have any idea why Canon all of a sudden think that the world is rich because everthing new that canon bring out or super seed is twice the price. I looked at the canon 24-70mm l lens and nearly fell over with shock at what they want for it £2000 as apposed to the mark i at £1000, so why the huge increase in prices? IMHO the 6D for what it has is not worth that money. Personally i would rather save a little more and buy the superb 5d mark iii. I must say though does any one have any idea why Canon all of a sudden think that the world is rich because everthing new that canon bring out or super seed is twice the price. I looked at the canon 24-70mm l lens and nearly fell over with shock at what they want for it £2000 as apposed to the mark i at £1000, so why the huge increase in prices? I think a lot has to do with the exchange rate and not to Canon wanting get as much money as possible out of us. Im going to Singapore & Australia in a few weeks and the exchange rate has dropped massively since i last went about 5 years ago. You will now get 2 singapore $ to the pound. 5 years ago i got 3.5 $. In Australia i would have got 2.5$ now ill get 1.5$. the pound maybe recovering against the euro but thats more to do with the euro going down rather than the pound going up. The pound is still very weak against most of the big currencies and has lost about 40% on average in many cases. This is not a bad thing. it make imports more expensive but our exports a lot cheaper. We are probably the only country in the world whose car manufacturing is on the up. that because of the cheap pound. If you want cheaper cameras. we should get canon and nikon to set up a factory over here. I think a lot has to do with the exchange rate and not to Canon wanting get as much money as possible out of us. Im going to Singapore & Australia in a few weeks and the exchange rate has dropped massively since i last went about 5 years ago. You will now get 2 singapore $ to the pound. 5 years ago i got 3.5 $. In Australia i would have got 2.5$ now ill get 1.5$. the pound maybe recovering against the euro but thats more to do with the euro going down rather than the pound going up. The pound is still very weak against most of the big currencies and has lost about 40% on average in many cases. This is not a bad thing. it make imports more expensive but our exports a lot cheaper. We are probably the only country in the world whose car manufacturing is on the up. that because of the cheap pound. If you want cheaper cameras. we should get canon and nikon to set up a factory over here. That would tick the box for me. I have a 7D but would love some better lenses. Flexing the plastic in Singapore would definitely be well up on my list - and a beautiful country to try out my new glass! The "benefits" either a 5D III or a 6D would offer me don't justify the outlay.